Are entrepreneurs born or made? Steve Welch, the founder of Mitos Group and co-founder of DreamIt Ventures, has an idea. 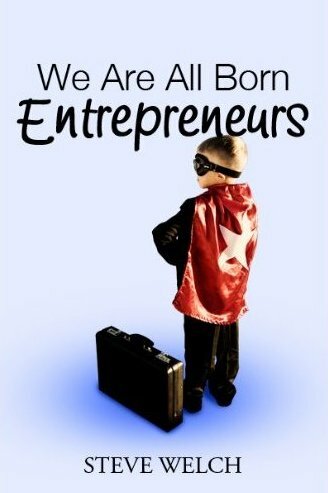 His new book, “We Are All Born Entrepreneurs“, chronicles the struggles and successes of men and women across the United States who overcame amazing odds to build successful businesses from scratch in the quest for the American Dream. “I compiled over a dozen stories that I believe provide learning experiences for aspiring entrepreneurs and also answered the question of why so many of us find purpose in entrepreneurship,” says Welch, an Eisenhower Fellow. During his interviews with entrepreneurs across the country, Welch realized that although each had pursued a different path, there were certain traits and skills that successful entrepreneurs seem to possess. During his work with young entrepreneurs in Philadelphia-based DreamIt Ventures, Welch became frustrated with what was being emphasized in MBA schools. “Too often I saw entrepreneurs focusing on raising money, as if raising money was the validation of a viable business.” It’s a clear sticking point with Welch, who had bootstrapped his first business Mitos in 2001. Without ever raising outside money, Steve built Mitos into a global company in the biotech manufacturing field before selling it to Parker Hannifin, a Fortune 500 company, in 2007.